If you are looking for shoulder braces that can treat various conditions, then you have landed at the right place. Here, at Sandalwood Physiotherapy, our wide range of shoulder braces in Brampton & Caledon help to protect your shoulder from several unsafe movements as well as promote safe healing. Shoulder injuries such as accidental falls and sports injuries. Pain due to overuse or repetitive actions. Rotator cuff, sprains or strains. It's level of support you needed depends on the nature of the injury or the situation of an individual. After an operation, you will need a high level of support while mild sprains or strains require a lower level of comfort and it will take a long time to become healthy. Wearing shoulder brace due to injury, after an operation and chronic pain can speed up your recovery as well as prevent unexpected movement of the shoulder that may cause extreme pain. 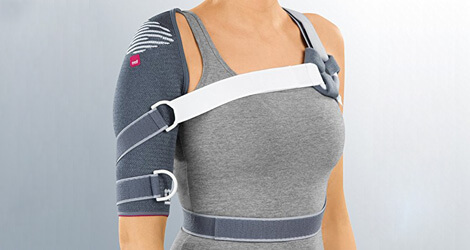 We have a comprehensive range of shoulder supports in Brampton & Caledon such as clavicle supports, shoulder immobilizer, shoulder slings, pediatric shoulder braces, waterproof shoulder braces and many more. Whichever shoulder brace you choose, we ensure that it will meet your needs.